The bankruptcy of Avianova, Russia’s fastest-growing LCC, highlights the difficulties of emerging markets that lure investors and their LCC start-ups into complex but evolving sectors with promises of explosive growth. Avianova's bankruptcy follows financial difficulties after a dispute between its two shareholders, Russia’s A1 Investments and US-based LCC investor Indigo Partners, showcasing the risk of foreign-managed operations in markets that have only recently begun to open up. It is an experience Avianova CEO Andrew Pyne was exposed to at his previous start-up, low-cost long-haul carrier Viva Macau based in the captivating region of the Pearl River Delta. And in the other big growing market – China – LCCs are still trying to gain a foothold. Avianova’s collapse is a major setback for the development of the low-cost sector in one of the world’s fastest-growing markets with low LCC market share. But the Russian market, despite its myriad regulatory, geographic and infrastructure challenges, remains a market brimming with potential for low-cost operators. LCC penetration remains very low, and demand for air travel, particularly in the short-haul space, continues to grow at breakneck speed. Further LCC start-ups are inevitable, but foreign-backed entrants are unlikely to be attracted. Moscow Sheremetyevo-based Avianova, which launched services in 2009, announced on 03-Oct-2011 it would file for bankruptcy due to mounting financial difficulties, largely a result of the two shareholder’s ongoing disagreement over the provision of further funding to Avianova and the airline’s management team. The dispute culminated in Jun-2011, when the expatriate senior management team was locked out of the airline’s offices in Moscow. The senior team, comprising CEO Andrew Pyne, CCO Mike Hayden and COO Guy Maclean, have all since left the airline and been replaced with Russian management. Avianova confirmed on 04-Oct that A1 and Indigo Partners had agreed to terminate their joint venture and would place the airline into bankruptcy. According to the airline, the bankruptcy is a result of Indigo Partners’ withdrawal of funding for the airline. The bankruptcy follows a series of offers made to A1 for a sale and a recapitalisation of the airline, Avianova said, although the Russian investment firm disputes this claim. Arizona-based Indigo Partners, which has invests in LCCs including Spirit Airlines, Tiger Airways, Mandala Airlines and Wizz Air, held a 49% stake in Avianova. Russia’s A1 Investments, part of the Alfa Group, held the balance. All parties involved, including Avianova, the airline’s former expatriate management team, the incumbent (Russian) management team, Alfa Group, Indigo Partners and auditors KPMG, have weighed in on discussions about the airline’s collapse. Claims and counter-claims are being circulated, largely between Russian stakeholders and those based abroad. Continued to sell tickets to passengers for future services despite knowledge that these services could not, in reality, be operated. Mr Pyne acknowledged the seriousness of the claims and said he is prepared to substantiate them with the relevant authorities. A1 has disputed Mr Pyne’s claims. The perspective of the Russian management team is different. Their main contention, according to the Moscow Times, is that Indigo Partners had a conflict of interest as the firm held ownership stakes in both Avianova and Wizz Air, another Eastern European-based LCC. This conflict resulted in Indigo Partners’ repeated blocking of Avianova’s expansion while Wizz Air added aircraft and new routes, Avianova’s Russian management believes. Yet Wizz Air does not serve Russia and Avianova's sole international route is to the Ukraine. There is no overlap, and potential for future overlap was small. Russia’s A1 has previously expressed dissatisfaction with Indigo Partners’ appointment of the expatriate management team, which was done without A1’s consent, and the fact the US private equity firm exercised greater control over the airline’s management, despite its marginal lower shareholding. Indigo Partners, on the other hand, has blamed the collapse on "reasons outside [its] control", adding the firm has no "oversight and control" of the company since the expulsion of the expatriate management team in Jun-2011. “Since that time, Indigo's efforts to regain its influence and save the airline have been to no avail,” Indigo Partners said. Avianova’s acting general director Konstantin Teterin said the airline’s final service would operate on 09-Oct-2011. "From 09-Oct, we will suspend the activities of the airline," he stated. “All the necessary documents are being prepared for submission to the Federal Air Transportation Agency." All passengers with tickets for travel following 09-Oct will receive a full refund, which could be another sticking point for the LCC, as 67,400 tickets for travel after 09-Oct have been sold, with the airline owing its customers USD5 million in refunds. The LCC’s six A320s will be returned to lessors, some of whom had launched court bids to repossess them in recent weeks, Mr Teterin said. Irrespective of the shareholder’s disputes, Mr Pyne states Avianova’s closure, which he described as “the most unnecessary and avoidable of outcomes", is “a tragedy” for the Russian market. Its demise leaves lesser-known Sky Express as the only LCC in the Russian market. Avianova had operated for 20 months and despite the fact it was a minnow compared to rapidly-growing Aeroflot and Transaero, the LCC chalked up impressive growth in its short history. The airline served 20 destinations, 19 of them in Russia and one in the Ukraine with a fleet of six A230s. Prior to the shareholder’s dispute, when the airline “was in great shape”, Mr Pyne claims, Avianova had serious aspirations as an airline. Avianova's passenger numbers surged ahead in 2010, with the LCC carrying 1.3 million passengers in its first full calendar year of operations, at an average load factor of 77.9%. In the first seven months of the year, passenger numbers increased 22.2% to 740,115, ahead of the system growth rate of 14.9%. 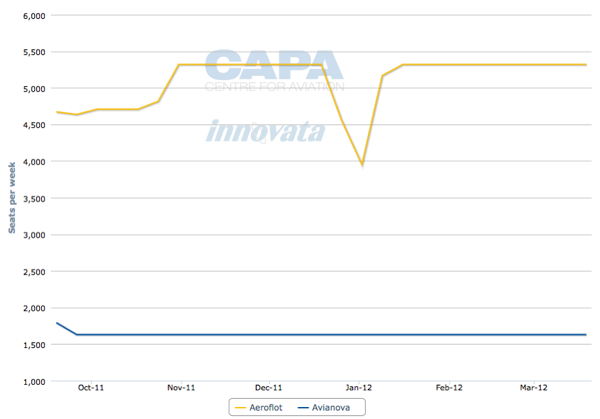 Avianova’s RPKs increased 40.6% in the period and load factors were up 1.5 ppts to 76.8%. The airline was the 11th largest (by passengers carried) in the notoriously fragmented Russian market, an impressive feat in light of its relatively short history. 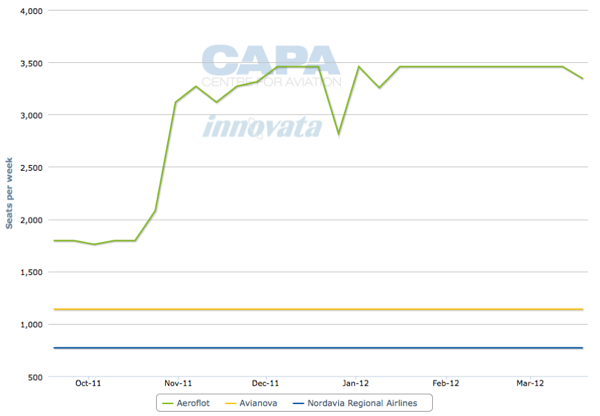 Avianova had gained far more momentum in its short history than Sky Express, its only other low-cost rival. 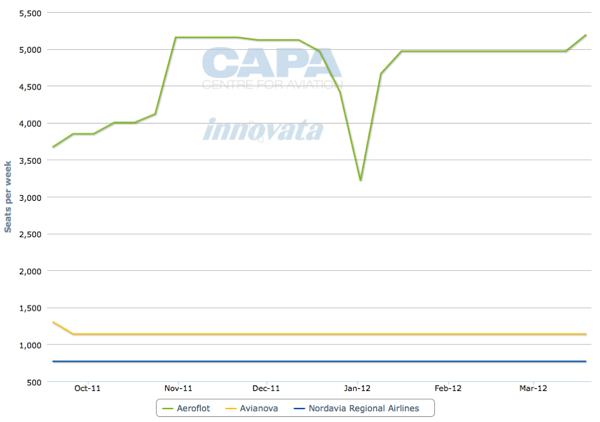 Despite Sky Express’ longer history, Avianova carried more passengers across a wider network on higher average loads. As would be expected with the Indigo Partners’ pedigree, the LCC employed strategies that saw it pursue the stripped-back “pure” LCC model. Its marketing tactics were broadly similar to Ryanair’s with very low lead-in fares of RUB250 (USD10). In another echo of Ryanair, Avianova aimed to ultimately lower fares to “nothing”, generating revenue solely through ancillary offerings. Due its ambition, aggressive growth plans (prior to Jun-2011), and most significantly, its experienced management team and owners, Avianova was generally considered to be the airline carrying the LCC flag in the fledgling Russian market. 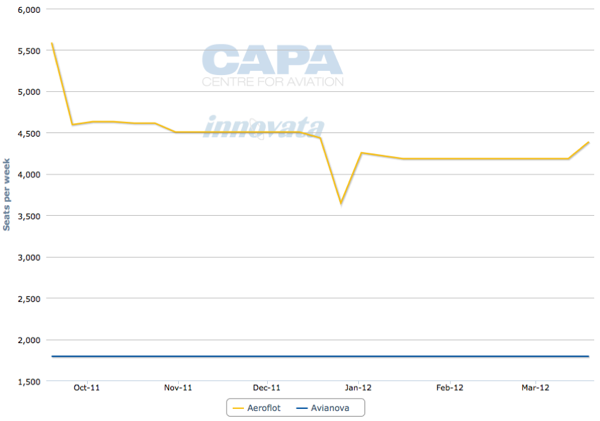 Avianova’s growth trajectory was particularly impressive in light of Russia’s very low LCC penetration. Russia offered, and will continue to offer, far greater potential opportunities for LCCs than many other regions. Russia is a rapidly growing aviation market, but it features among the lowest LCC penetrations rates in the world, implying a considerable upside in terms of market share gains. Despite the enormous potential that could be unlocked by low fares, LCC market share remains far below the world average and below LCC market share in other key emerging markets, at just more than 5%. Russia’s largest operators, including Aeroflot, Transaero and S7, have largely dismissed the LCC model, saying that it is defined by several characteristics that have proved difficult to emulate in the Russian market. The incumbent majors note that short-haul sectors are generally the bread and butter of LCCs, and owing to Russia’s size there are vast distances between densely populated regions, and even greater spaces between major commercial centres. The shorter sectors also allow higher utilisation, which helps keep a lid on costs. Large-scale traffic flows are LCC target markets, and Russia, with its uneven population spread has only a handful of trunk routes, they claim. LCCs usually target secondary airports, where charges are cheaper, which are not as readily available in Russia. Unpredictable regulation – which often creates discriminatory positions – also constrains growth. Avianova reduced its seat count, breaking from the traditional LCC configuration of 180 seats in an A320, by taking out 21 seats to pay a lower import tariff. These factors mean cost differentials between Russian LCCs and full-service carriers can often be negligible. 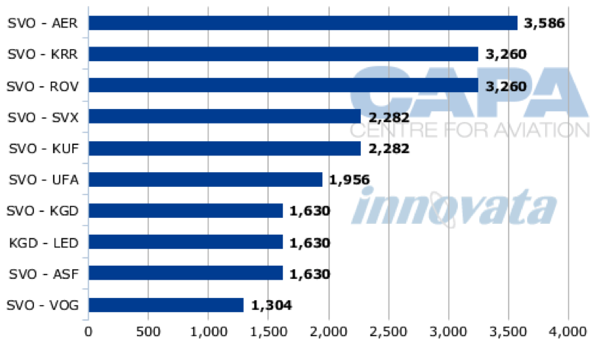 In addition to this, full-service carriers in the Russian market can achieve surprising efficiency. Aeroflot, for example, is generally viewed as one of the world’s most efficient carriers and has been profitable in every year of the past 10. According to analysts from Goldman Sachs, Aeroflot’s cost base screens close to those of LCCs. However, due to the Russian Government's heavy presence in the market and its 51% stake in the national carrier, Aeroflot is likely to be a more efficient operator than its domestic peers. 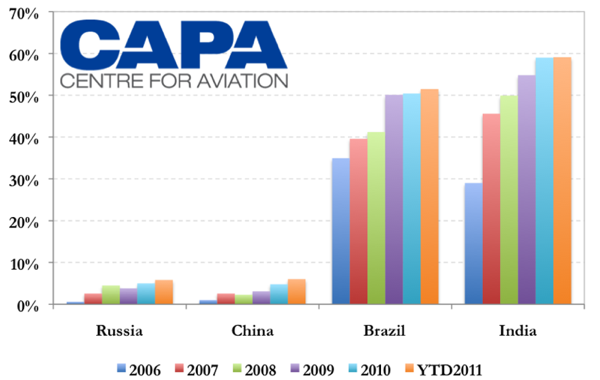 The strong growth of the Russian market – growing 26.2% in 2010 to 56.9 million passengers – without a significant LCC presence, is also likely to deter major Russian airlines from taking an interest in the low-cost model. With the majority players growing about 15% per annum, there is little incentive to shake up the business or move into a higher-risk business model. Mr Pyne founded Avianova after leaving in Jun-2007 Viva Macau, another brainchild of his. Viva Macau aimed to serve medium/long-haul routes on a low-cost basis from Macau, Asia's growing entertainment capital that has surpassed its American counterpart, Las Vegas, and offered further potential as a gateway to the Pearl River Delta and nearby Guangzhou and Hong Kong. As Avianova was ratcheting up passenger numbers last year, Viva Macau collapsed. On the surface the two had different causes leading to their collapse: Avianova was attracting passengers while Viva Macau was not; Avianova's investors jarred while Viva Macau's did not. But they shared the same underlying problem: contention with the status quo in emerging markets the carriers wanted to revolutionise. Avianova's dispute between foreign management and local investors was very public and, with management being locked out of their own office, eccentric. Even if Indigo Partners was inclined to favour its investment in Wizz Air – perhaps they rightfully saw Hungary as a more stable environment – Avianova was focused on the Russian domestic market, which Wizz Air could not enter. Further, Wizz Air did not even serve a single route into Russia. Whatever prospects Avianova had for international growth – at the time of its grounding its sole international route was to Ukraine – overlap between Avianova and Wizz Air would have been small even if Wizz Air entered the Russian market. Mr Pyne and Avianova's former management team may be wondering what their local partners' reckoning was. It would have been a similar question to ask in Macau. Viva Macau operated on a sub-concession agreement with Air Macau, who was granted a monopoly on local services when the backwater region with little prospects needed an incentive for a home carrier. Viva Macau expected to be able to operate medium- and long-haul routes with approval from Air Macau, whose sole focus was on short-haul, regional routes with two carriers posing no competitive threat to each other. Indeed, Viva Macau – taking the higher ground – saw potential for the two carriers to work together and feed their networks. But time after time Air Macau refused to grant Viva Macau route permission, even when Air Macau did not serve the route while the market was being cornered by foreign LCCs. Both Macau and Russia promised enormous potential, but now Mr Pyne may be wondering which market he would prefer to clarify its seemingly irrational conduct. It is not just foreign vs local contentions that can drive instability. LCCs have yet to gain a foothold in China, the other alluring market with forecasts of rampant growth. Restrictions in Chinese aviation match the complexity and volume of the country at large. Fares and fuel are regulated, airport fees provide little room for negotiation, and even smaller statutes exist. Okay Airways ditched its LCC model while Spring Airlines, patiently waiting, is finally making inroads – but in a country of 1.3 billion, its 24 A320s cannot establish a full LCC market. Detractors argue there is protectionism of China's status quo of having big, state-owned carriers. Timing in China for LCC penetration is when, not if. The LCC gap in Macau has not been filled locally but will be in Russia. In 20 months and with six aircraft Avianova recorded strong growth across its expanding network at the expense of its larger network peers but also by stimulating new traffic flows – re-dividing the pie while growing it. Although information about Avianova’s earnings has never been made available, its rapid growth, always outpacing the system growth rate, would no doubt have caught the attention of Russia’s major carriers. While Aeroflot, Transaero and S7 would be glad to be rid of a competitor, no matter its size, the model’s success in stimulating traffic flows and popularity with Russia (perhaps due to its racy marketing strategy) is likely to leave a lasting impression. While the Russian market has grown strongly and is likely to continue to do so without a significant LCC presence, it is interesting to consider the growth rates that could be reached if LCCs were able to make inroads and bring more affordable air transport to the Russian population. 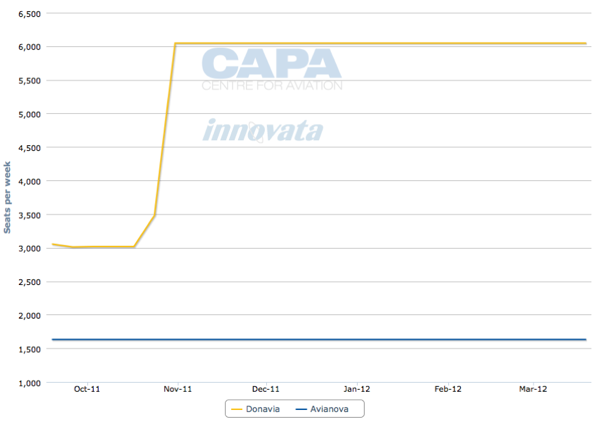 Avianova was primarily a domestic operator, with a network of 20 destinations in European Russia and the Ukraine. Owing to its base at Moscow Sheremetyevo, where Aeroflot is also based, Aeroflot was Avianova’s largest competitor. 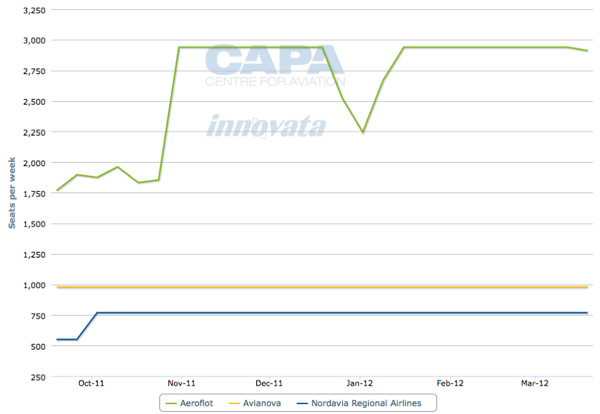 The two airlines competed on all of Avianova’s busiest routes, with Aeroflot having a larger presence on all of them.